A revolver owned by scholar and writer JRR Tolkien during his World War I service has gone on show at Imperial War Museum North, in Manchester, as part of the preliminaries of its commemoration of the Centenary. Tolkien served as a signals officer in the 11th Battalion, Lancashire Fusiliers from June to October 1916, when he became ill with trench fever and was sent back to the UK to recuperate. While in hospital he began to formulate ideas that he would use in his books The Silmarillion, The Hobbit and The Lord of the Rings. The weapon on show in Manchester is a Webley Mk VI, standard issue for British officers during World War I. 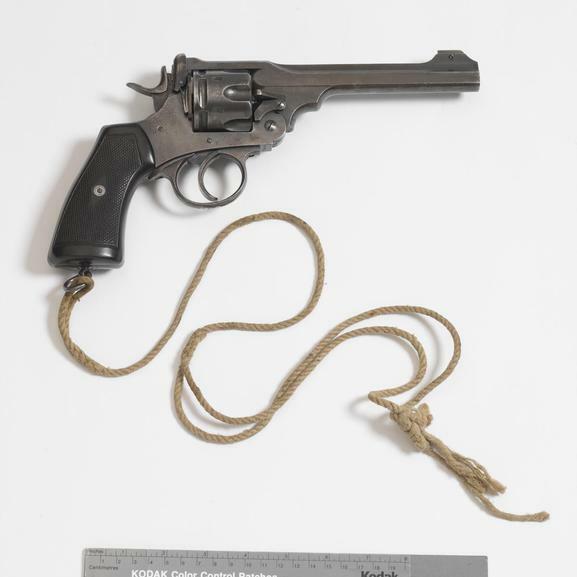 In 1996, Tolkien’s family gave the gun to the Imperial War Museum. Effects of World War I Tolkien’s experiences on the Western Front shaped his later books, with episodes such as Frodo Baggins’ experience in the dead marshes in The Lord of the Rings, where he sees dead warriors in pools amid a desolate landscape, a reminder of the realities of the Somme and Ypres. The writer also said that Sam Gamgee, Frodo’s dependable and heroic servant in The Lord of the Rings, was ‘a reflexion of the English soldier, of the privates and batmen I knew in the 1914 war, and recognised as so far superior to myself’. The exhibition at the Imperial War Museum North coincides with the cinema recent release of The Hobbit: The Desolation of Smaug. Graham Boxer, director of IWM North, said: ‘Visitors will be able to see this weapon and connect further with Tolkien’s magical stories which were born from harrowing wartime experiences.’ . This entry was posted in Events, News, Soldiers of the Great War and tagged 11th Battalion, Battle of the Somme 1916, Centenary of World War I, events, Frodo Baggins, Graham Boxer, IWM North, JRR Tolkien and World War I, Lancashire Fusiliers, news, Sam Gamgee, The Hobbit, The Hobbit: The Desolation of Smaug, The Lord of the Rings, The Silmarillion, Webley Mk VI. Bookmark the permalink.